The Beyerdynamic DT 1990 Pro headphones are made for professionals, but even though they have a fairly neutral response they're not boring in any way and are great to listen to. 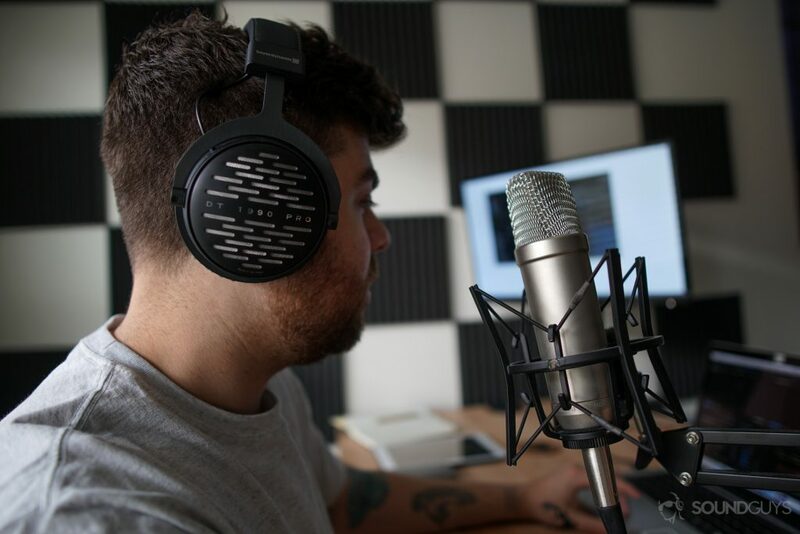 Not long ago I reviewed the Beyerdynamic DT 990 Pro headphones, which were easy to recommend to anyone looking for an entry-level pair of headphones for audio mixing. But what if you’re not a beginner? What if you’re past the novice stage and are looking to upgrade to a pair of cans that will keep up with the work you do? Enter the Beyerdynamic DT 1990 Pro headphones. There are some similarities between these and their predecessors, but for the most part, the DT 1990 Pro headphones are better in every meaningful way. The headphones aren’t the most portable and don’t fold or have any rotating ear cups. Professionals. Whether you’re a freelancer or are employed at a big-time company, these are going to make doing your job more enjoyable. Especially if your job requires you to spend hours wearing headphones. Someone without a budget who values sound quality. Anyone looking for an enjoyable sound and doesn’t mind being plugged into something that’s most likely sitting on your desk. The headphones are large, but comfortable to wear. At some point in your life, you may have heard about the beauty that is German engineering, and the Beyerdynamic DT 1990 Pro headphones are a prime example of that. The headphones are made almost entirely of matte black metal (my favorite kind of metal), with only the bare minimum plastic covering the wires. They’re also open-back and show off that fact with intricate offset cuts into the side of each ear cup. From a distance, it looks shiny and noteworthy, but getting close up you’ll see it’s just a small grille that separates the drivers from the air. It’s that attention to detail that you’ll find all over these headphones. They come with two sets of ear pads for what Beyerdynamic says is for “balanced” or analytical listening. The ear pads give a slightly different sound signature (which we’ll get into a little later) and are wrapped in a plush velour that makes them as comfortable as they look. They come with the “balanced” ear pads pre-installed, but I’d recommend switching out to the analytical ear pads for no other reason than comfort. The headphones come with two sets of velour ear pads for balanced and analytical listening. Not only is the plush softer and easier to wear for longer periods of time, but they’re also a slightly lighter gray which I think matches the overall color of the headphones better. My one issue here is the convoluted method Beyerdynamic expects you to swap them out. Each ear pad has a small flap, which needs to be placed in a small notch on the ear cup. Rotating the ear pad should align the entire thing in place, and it worked perfectly the first time. But the left ear cup took me twenty minutes to align correctly and even still, some of the flap didn’t take. As clever as it seems at first, there has to be a simpler solution to this problem. That said, I’d still recommend dealing with it at least once so you can swap on the softer ear cups. Taking a step back, you can fully appreciate the overall build even further thanks to the padded leather headband and removable cable on the bottom of the left ear cup. As great as the DT 990 Pro headphones are, the plastic build and attached cable don’t inspire too much confidence. That isn’t the case here. You’ll get a 3-pin mini XLR cable that snaps into place and doesn’t budge afterward. Up top is the adjustable headband wrapped almost entirely in soft but firm leather. At 370 grams these headphones aren’t going to float over your head, but they’re not going to hurt either. They did get a little warm after a while—as you might expect from giant velour ear pads like these. How do you connect these? The headphones might require an amp since they have an impedance of 250 ohm. Now is when we get to the fun stuff. Both cables have an impedance of 250Ω which means you’re probably going to need something to sufficiently drive them. Is it completely necessary? Usually, we’d say not really but here it might be necessary. Plugging these into my laptop (and even iPad) let me hear what was going on just fine… but I had to crank to volume to 100% on those devices just to get to what would normally be around 70%. If you don’t want to deal with that annoying issue, picking up a decent amp will do wonders. If you’re planning on making these your main workhorse, then you should already have a somewhat decent audio interface to plug into which should get the job done. These use a 3-pin mini XLR cable to connect, and come with two cables (coiled and straight). You’ll get two cables in the box, one 3m straight cable and another coiled cable that can reach 5m when stretched out. Though it’s roughly 1m when not stretched out and I found it more than enough. Both cables have a 3-pin mini XLR on one end and a 3.5mm jack on the other. But both cables also come with their own screw-on ¼” adapter which was nice. Usually, companies just toss one in the box, but Beyerdynamic made sure to put one on each so you’ll be ready to go as soon as you take them out. The DT 1990 Pro headphones are for audio production. Depending on what you’re looking for, you can get two kinds of sounds out of these by switching out the ear pads. The differences between them are subtle, but they’re there. The ear cups obviously don’t change the way the drivers sound, but if you opt for the “balanced” cups (the one with a bunch of holes on the back) you will get a slightly more emphasized low end than the analytical ear cups. Like I said, it isn’t too aggressive a change, but the headphones already have a decent low end without any help. So, for the purposes of this review, you can assume that everything I say from here on is with the analytical ear cups on. The low end on these is more or less flat, but it’s a little bumped in relation to the mids. The bass notes in the song “Moon River” by Frank Ocean extends easily in the lower mids but not in a bad way. Everything sounds pretty accurate, and nothing seems to be fighting for attention. This could be because the mids sound a little recessed, but vocals aren’t as emphasized as some people might like. They’re not really lacking in clarity, and vocals in the song “Wait by the River” by Lord Huron still have plenty of quality, but there seem to be sitting in between the instruments that make up the lows and highs—rather than popping out in front of them. Personally, I think it sounds fantastic. The open-back design and slight emphasis on the higher frequencies make hi-hats and cymbals sound damn near perfect. We should also talk about soundstage because it’s actually not as great as I was expecting. It’s good, but it’s only slightly better than the DT 990 Pro headphones. I guess I was expecting more of an upgrade, but as it is with most high-end equipment, you can end up paying a lot for only a small upgrade. It should also go without saying that sound leakage is at a maximum here. If you’re looking to wear these at the office, I hope you have a door you can close or you’re going to annoy your co-workers. Unless you have such exquisite taste in music that they always interrupt you to ask, “Hey, what song is that?” which can be an issue all on its own. The Beyerdynamic DT 1990 Pro headphones are open-back. Even though they’re meant for professionals, these are really fun to listen to casually as well. The Beyerdynamic logo is printed onto the leather on top of the headband. If you have a budget of around $400 – $600 for a pair of headphones and only care about listening to music, then yes. These cost $599 for the headphones (and $599 for this sick bundle), but if you’re going to buy a pair of $400 headphones I would definitely recommend saving just a little more and splurging on these. Beyerdynamic did a great job making the DT 1990 Pro headphones practical for work but they’re also really, really enjoyable. The build quality is top notch and they’re comfortable enough to wear for hours. But it should go without saying that these aren’t for anyone who wants to go portable. Though they come with a nice carrying case, it’s more a way to get them from one desk to another rather than taking them out for a quick listen on the subway. If you do decide to pick these up you should also have a decent amp to drive these, otherwise, you’re going to be saving up another $100 – $200 on top of the money you have to shell out here. The Beyerdynamic DT 1990 Pro headphones aren’t for beginners. These shouldn’t be “Baby’s first headphones”. You should know what you’re getting when you buy these: a large pair of sturdy headphones that basically can’t be used anywhere but your desk or couch. But man, do they sound good. When a new album comes out I’ll be reaching for these from now on. At least, until I have to send them back.